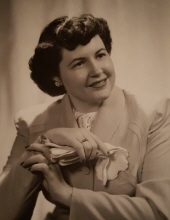 Phyllis Evans Husted, a former long time resident of Hatboro, died, Nov. 8, 2018 in the Abramson Center, North Wales. She was 92. She was the wife of the late Robert H. Husted with whom she had shared 62 years of marriage. Born in Marcus Hook, PA she was the daughter of the late Benjamin and Alice (Hobbs) Evans. She is survived by her daughter, Barbara Husted Eisenberg and her two grandchildren, Sara A. Eisenberg and Max I. Eisenberg. She was pre-deceased by her daughter Janice and sister Dee Dee. Her family will greet relatives and friends after 11 am, Saturday, November 17 in James R. Baskwill Funeral Home, 20 W. Montgomery Ave (half block west of York Rd) Hatboro where her memorial service will be held at 12 pm. Her interment will follow in Lawnview Cemetery. To share memories or photos of Phyllis, please visit the funeral home web site listed below. To send flowers or a remembrance gift to the family of Phyllis Husted, please visit our Tribute Store. "Email Address" would like to share the life celebration of Phyllis Husted. Click on the "link" to go to share a favorite memory or leave a condolence message for the family.